Will Obama Support Egypt's War on Radical Islam? Originally published under the title, "Egypt's Sisi wants to defeat radical Islam. When will Obama, US support him?" Secretary of State John Kerry told Egyptian President Abdel-Fattah al-Sisi last week that he "expect[s] a decision very soon" on the full restoration of U.S. military aid to Cairo. As I have written before in this space, Sisi appears to be a surprising successor to the heroic British leader who first rallied his own people, then appealed to the New World to join not only his, but humanity's, cause against the Nazi menace—which is in many ways similar to the Islamist one today. Despite America's declared need for strong Arab allies in the war against ISIS, which Sisi is already fighting in the northern Sinai, and has even bombed in Libya, our own government's commitment is still pending. After meeting with Sisi last week at the giant Egypt Economic Development Conference (EEDC) in the southern Sinai resort of Sharm el-Sheikh, Secretary of State John Kerry said on March 14, "I really expect a decision very soon," about restoring the full $1.3 billion in annual U.S. military aid, largely suspended since the ouster of former President Mohammed Morsi at widespread popular demand in July 2013. While swearing his own support for Sisi's program of economic liberalization, Kerry could not say the renewal of the whole aid package would be approved. Given that Kerry has seemed more positive about Sisi than his boss, President Obama, for some time—with little effect -- his influence may not be decisive. Despite America's declared need for strong Arab allies in the war against ISIS, our government's commitment to Sisi is still pending. Meanwhile, Sisi announced on March 16 that the EEDC—featuring 3,500 delegates from 52 countries, among them 50 heads of state--had produced an impressive $60 billion in direct investment and soft loans, all desperately needed after 4 years of political upheaval and economic destruction. The action was led by Saudi Arabia, the United Arab Emirates and Kuwait—Sisi's main partners against the Islamists, apparently with little American involvement beyond private investments by General Electric. Yet despite America's declared need for strong Arab allies in the war against ISIS, which Sisi is already fighting in the northern Sinai, and has even bombed in Libya, our own government's commitment is still pending. The Obama administration backed Morsi and his Muslim Brotherhood organization during the Arab Spring, when they rapidly established an elected Islamist dictatorship, prompting the largest demonstrations in history. The U.S. and Western media have lost credibility with most Egyptians for their criticism of Sisi for cracking down on the MB and other Islamists since taking power as well as elements of the secular opposition who refuse to seek permits to stage demonstrations, a measure imposed to limit the chaos that has prevailed since the 2011 overthrow of long-time president and U.S. ally, Hosni Mubarak, plus extreme behavior by the judiciary, which Sisi insists must remain independent. The criticism has ignored or minimized a terrorist campaign to overthrow Sisi—himself freely-elected in June 2014—by the once ostensibly (but never really) peaceful MB, which openly backs the global jihad. But Sisi's critics were silent when Morsi, during his year in power, openly smashed opposition to his rule and declared himself above the Constitution and the courts. American aid then actually increased—but has been slashed under Sisi, who gained twice as many votes in 2014 as Morsi did in 2012. The American-trained Sisi has been forced to radically diversify his lines of military supply. MB television channels have lately broadcast calls to murder Sisi and journalists who back him, as well as a demand by a newly announced group, the Revolutionary Punishment Movement, that all foreigners leave Egypt by the end of February--or else be "hunted down." Meanwhile, U.S. backing for the MB has not ended: the State Department hosted a delegation of MB-allied former lawmakers from Egypt at Foggy Bottom on January 28. That group also met with a representative from the White House the same day—shocking Cairo even further. All this has driven the American-trained Sisi—very reluctantly—to radically diversify his lines of military supply, signing a $3 billion purchasing agreement with Russia (with which Egypt will also build its first nuclear power plant) and a $5.5 billion deal with France to buy its advanced Rafale fighter-bomber. 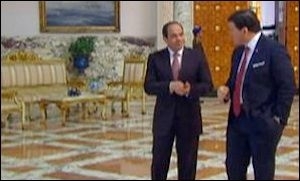 Bret Baier traveled to Cairo to speak with Sisi earlier this month. In recent interviews with Bret Baier on Fox News and with Lally Weymouth of the Washington Post, the Egyptian leader—known for his calm and quiet demeanor—pleaded for the return of America's aid to his country to fight our common enemy. 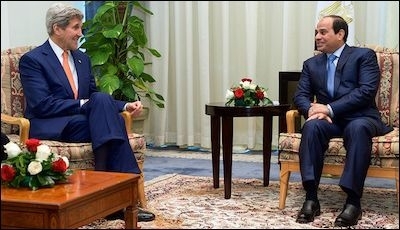 Let me say that the United States has been helping Egypt a lot throughout 30 years or more. And Egypt now needs U.S. help especially in the military field more than ever within the framework of the Egyptian counter terrorism effort in Sinai and to defend the land of Egypt against any potential threats especially terrorist threats. It is very important for the United States to understand that our need for the weapons and for the equipment is dire especially at a time when the Egyptians feel that they are fighting terrorism and they would like to feel that the United States is standing by them in their fight against terrorism." I mean Saudi Arabia, the Emirates, Kuwait, Bahrain, Jordan, Egypt and other Arab countries can come together and form this ready force that will be capable of defending our national security and encounter all the potential dangers that we might face. We have to admit that terrorism is now a major threat not only to Egypt or even the immediate region, but it is a threat to the stability and security of the whole world. We have also to admit that it is not only ISIS that is threatening Iraq and Syria but there are a lot of other similar terrorist organizations and, by the way, they all work under the same umbrella. They all come from the same parent ideology and work under different names. "Egyptians ... would like to feel that the United States is standing by them in their fight against terrorism." Worse, he added, "We can also say that the map of terrorism extremism is expanding." Indeed, ISIS has now spread beyond Syria and Iraq into northern Lebanon, Egypt's northern Sinai, southern and northern Afghanistan, northwestern Pakistan, Libya, the Philippines and elsewhere, while other al-Qaeda affiliates are also strong in many of the same areas and beyond, even as evidence exists that they cooperate as well as fight at times. He includes the MB—the parent organization of all these groups—in the same jihadi category. It is not a revolution against religion. On the contrary, it is a revolution to support and reinstate the right meaning of religion, the right presentation of what religion stands for as it stands for tolerance, moderation, respect of the other, and appreciation of diversity. Sisi is the only leader of a mainly Muslim nation to have dared confront the establishment clerics, whose traditional teachings and interpretation of the religion he believes give both textual sources and succor to the jihadis. It's a very good question. Allow me to say to you that real Islam gives complete freedom to the human being to choose not only the person who is going through to rule the country, but the freedom to have a faith and to believe in God in the first place or not to believe in God in the first place. His defense of the rights of atheists—repeated in his talk with Weymouth of the Washington Post—is remarkable: whatever prejudice one finds against other faiths in Muslim societies, there is an almost universal abhorrence against having no religion at all. This is reflected in recent popular campaigns in Egypt against atheism and blasphemy, driven in part by Dar al-Ifta, the authority that issues official fatwas, resulting in a number of mob actions and even arrests and convictions of allegedly disbelieving Egyptians. Dar al-Ifta's staff were present when al-Sisi delivered his address at al-Azhar, an appeal that, along with his crackdown on extremists, may well cost him his life. Shall we continue to ignore Sisi's desperate pleas for help against the gathering jihadi storm? Weymouth's Washington Post interview struck many of the same themes, but yielded one truly new revelation: that Sisi talks to Israeli Prime Minister Benjamin Netanyahu "a lot." That probably makes theirs the closest relationship between any Egyptian and Israeli leaders to date—and indeed security cooperation between the two countries has increased enormously in the face of shared threats from Hamas, ISIS and their fellow-travelers—not to mention a probably soon to be nuclear-armed Iran. Will that intensely personal cooperation continue after Netanyahu vowed, on the eve of his successful reelection March 17, not to permit the establishment of a Palestinian state (since modified to a statement that, given the unity agreement between Hamas and the Palestinian Authority and ISIS moving ever closer to Israel via Syria, it is simply not possible now)? And will Kerry have news of an Egyptian-American spring—after the disastrous Arab one—soon? Or shall we continue to ignore Sisi's desperate pleas for help against the gathering jihadi storm?